Darkroom Magazine Italy 12 - 2011: ... Nel complesso una release notevole, sicuramente una delle più accessibili tra quelle prodotte dall'etichetta tedesca, ma non per questo banale o prevedibile. Indicato anche a chi ama progetti più recenti in vario modo connessi a questa scena (vedi ad esempio i Runes Order). 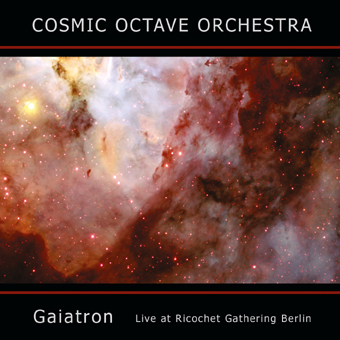 The album Gaiatron - a rare gem of cosmically tuned electronic music - contains the complete concert recordings of Cosmic Octave Orchestra, as performed as part of the "Ricochet Gathering - Electronic Music Festival" at Berlin Schöneberg Townhall on October 10th, 2010. 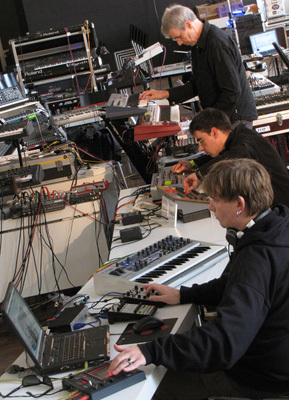 Three knowledgeable adepts and practitioners of cosmically tuned electronic music who have joined for this unique show at Ricochet Gathering 2010. Like the live performance the CD Gaiatron contains two epic electronic soundscapes in the spirit of the Berlin School of electronic music. Both, Gaiatron, the title track and the second piece Cassinidrive are tuned to the mathematical principles of the Cosmic Octave according to musicologist Hans Cousto. Gaiatron utilises the octave-analogue frequencies and tempi of the Earth's planetary year, its orbit around the sun. The COO was supported by the overtone canto of AlienVoices, Kolja Simon and Felix Mönnich. Cassinidrive is tuned to the octave-analogue tone of the planet Saturn's solar orbit. Two deep, precise sound journeys of truly cosmic music. This Klangwirkstoff Records release is now offering the concert's special listening experience to a larger audience. Certainly, already the opening title track, a half-hour long wormhole through swelling and ebbing bass drones, distant echoes of rhythmical pulses, otherworldly harmonics and moments of intense harmonic beauty, requires the full attention of its three captains to arrive at the right balance between restraint and active participation. And yet, the piece is merely a prelude of sorts for thirty-eight minute „Cassinidrive“, a stellar realisation of a single, uninterrupted stream of thought. From a murky opening sections – a romantic sunrise in the outer nebulae, perhaps – the Leitmotif of the composition emerges in the lower registers of the strings, gradually winding its way up towards the higher frequencies and morphing into a gently chiming sequencer line accompanied by airy shaker loops. At around the ten-minute-mark, it appears to have reached exhaustion point, but the musicians know better, shooting it through a four to the floor trance beat and a multitude delirious sound effects. Locked into this mesmerising groove, one doesn't want this machine to stop – and it thankfully never does, running for what seems a heavenly eternity on the strength of nothing but delicate variations and mesmerising melodic counterpoints. It is a piece which would probably have seemed out of date in 1980, but takes on an almost futuristic quality today: With its psychedelic depth and borderless freedom, Gaiatron is a grandiose backflash to a long forgotten era and the ideal of music as a vessel for space travel.